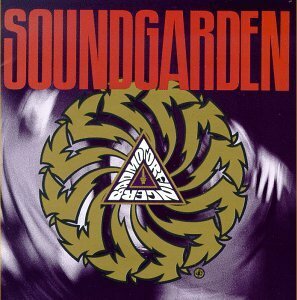 The single most important thing to say about Soundgarden's 1991 album Badmotorfinger is that its release was the moment Chris Cornell went from being the singer in a hard rock band to being one of the greatest singers in the history of rock and roll. There are, of course, other important things to note about Badmotorfinger. New bassist Ben Shepherd not only made his bass-playing debut on this album, but also his songwriting debut. This would be less important if it were any other bassist, but Shepherd is so unique that his fingerprint was immediately audible to the listener. Prior to 1991, for example, Soundgarden never wrote anything even remotely like "Somewhere." But Shepherd penned not only that, but three other iconic songs on the album, and went on to be more or less the songwriting equal of the always-dominant Cornell. At the time, I recall the music press (especially the guitar magazines) making a big deal about the guitar tones on this album, which were decidedly heavy, and had a big, loud, low-end thump. This was naturally and fairly attributed to Kim Thayil's tweaking his Peavey Rockmaster amps in just such a way, and - allegedly - inventing the "grunge" sound. So Badmotorfinger is important for that reason, too. It ought to be pointed out, too, that drummer Matt Cameron wrote his most iconic drum beat for this album, too: the busy, driving, complex beat in "Jesus Christ Pose." But it's not just that song. It's safe to say that he really came into his own identity on this album. So, in a way, Badmotorfinger was a confluence of artistic events. Each member of the band came into their own identity in a way that happened to compliment the whole band and its other players. It's inevitable that this would be the band's true break-out album, and it's no surprise that it has since endured as one of the great albums of hard rock music. However, as I said, the most important thing to say about this album is that it represents the arrival of Chris Cornell, vocal virtuoso. His voice sounds so different from the band's previous efforts. He successfully pushed himself into vocal territory that few have ever really entered. His performance on "Slaves & Bulldozers" has quite possibly never been equaled. In the wake of this album, he would go on to become one of the most beloved vocalists of my lifetime, if not the most beloved. And it all starts here, on Badmotorfinger.